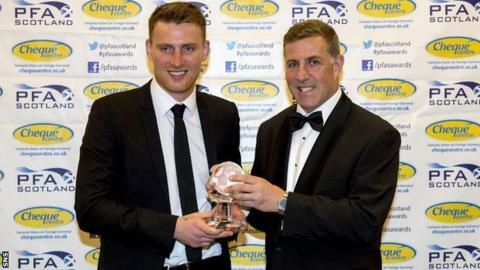 Peterhead striker Rory McAllister has won PFA Scotland's League Two player of the year award. The 26-year-old has scored 31 goals this season, with the Blue Toon having already won Scotland's third tier. Promotion to League One was secured when Peterhead clinched the title with victory over Clyde earlier this month. Former Brechin City and Inverness Caledonian Thistle player McAllister was presented with his award by Scotland assistant coach Mark McGhee.